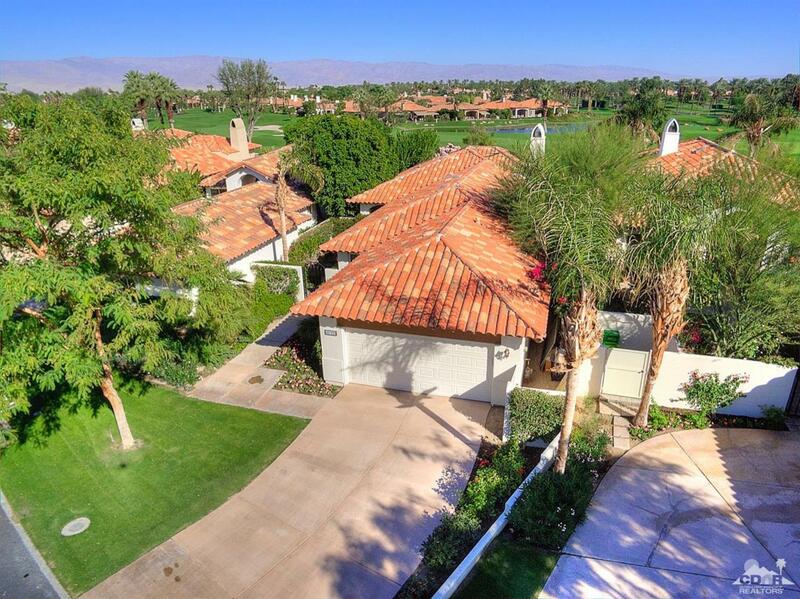 Located behind the gates of Rancho La Quinta Country Club. Enter the private gated courtyard w/lush landscaping & into this charming home w/ 3BR/3BA & approx. 2040 sq. ft. Relax & enjoy the beauty that surrounds this adorable home. The great room has soaring ceilings, a wet bar w/glass shelves, a media niche & a fireplace. The kitchen has a sunny eating area w/a slider to the private side yard. The formal dining room w/pillars & a lovely wrought iron chandelier. The spacious master bedroom has mountain & fairway views. Master bath w/a Jacuzzi tub, a separate shower, dual sinks & glass block making it light & bright! The guest rooms have baths & are away from master bedroom. The garage floor was recently epoxy painted & looks great! Close to the community pool & spa. Rancho La Quinta has 2 award winning golf courses. Amazing clubhouse serves lunch, there is fine dining as well, a full bar & pro shop. HOA dues include tennis/fitness/social memberships & cable! Furnishing are negotiable.